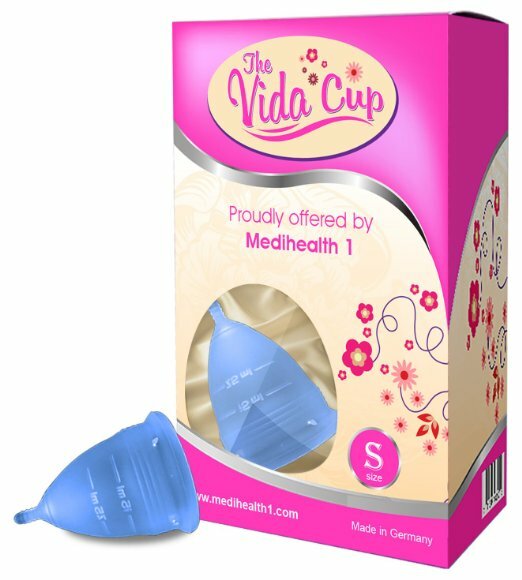 The Vida Cup has a similar shape to many menstrual cups. It is an inverted bell with airholes along the upper rim. Near the top there is slight ridge-like grips which will help hold the cup in place while wearing. The stem is short and solid with ridges that will provide grip while removing. The cup is graduated which can help if you'd like to track your period flow. Some may find that the relative softness of the Vida Cup makes it easier to insert, while others may find that it makes it harder to get the cup to pop open after it has been inserted. The relatively short size of the stem and the lack of grips around the bottom of the cup may make it more difficult to remove. The Vida Cup comes in two sizes, S and L. The smaller size is intended for people under age 25 who have not given birth or who have had a C-section. The large cup is best suited for those over 25. Reviewers observe that it is softer or more flexible than the Diva Cup. That may be more comfortable for some users, but others may find that it makes the cup harder to insert or more likely to leak. This cup would be no easier or harder to clean than other cups. This is one of the cheaper menstrual cups but the lack of details on its origin means its quality is uncertain. You may want to consider buying a cup that is explicitly certified by the health board in your country and that uses materials that are transparently sourced. While the cup reports using FDA-certified medical grade silicone, the cup itself has not been evaluated or cleared with the FDA.